I've been house bound for the last couple of days and I guess I could blame part of it on the weather but if the truth be known, I just wanted to get some projects done and others started...so the snow was my excuse. 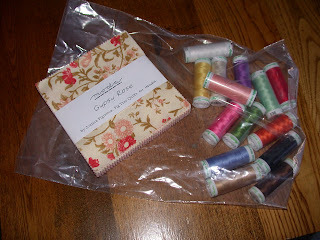 a charm pack of Moda's new Gypsy Rose line by Joanna Figueroa of Fig Tree Quilts and some Mettler fine embroidery cotton thread for the applique stitching. This is the thread that the gal who I took the back basting applique class from recommended, so my collection has started. I'll probably add a few more colors each time I go til I have them all. a light box. 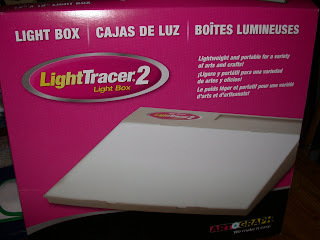 This has been on my "need to get" list for some time now as tracing applique patterns on my patio door at night just doesn't work. I also purchased some background fabric for Lucie's quilt so my plans for this evening are to get hers cut out in order to be able to work on both simultaneously. On the way back from the "big city", we took the dogs for a long walk on a nature trail that we frequent and stopped for lunch. All in all, we had a nice day...my DH, me and the fur babies. I'm not going to lie and say it was a "piece of cake" but last night I finished piecing the 10 blocks that make up the center of my Primitive Garden BOM. Whew! I just love the look of wool appliqued on cotton and am so happy with the appearance thus far. I still have the first border to complete which will be the same as the sashing strips, but I think I'll put this to bed for awhile, or at least til the first of the 4 outer border kits arrive. 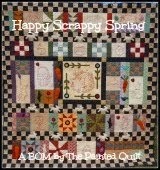 Just 4 more and then the BIG decision...to hand quilt or have it machine quilted? But I'm happy that is one more thing I can now strike off my "TO DO" list, for the time being anyway, and move on to my next project...the free Bunny Hill Designs BOM. 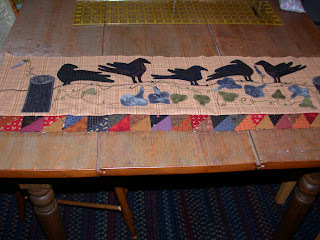 I have all the fabric picked out for the elements to be appliqued and am almost ready to proceed. I just need to cut out the background blocks from the fabric I purchased the other day and it's a go. 12" of the White Stuff! It started snowing yesterday morning at around 7:00 a.m. and it was still coming down at 10:45 p.m. when I finally turned out the last light and went to bed. 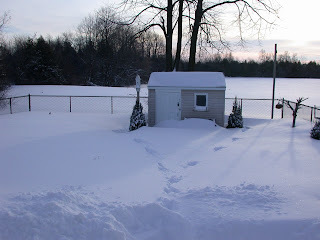 This is what our backyard looked like this morning just after daybreak. 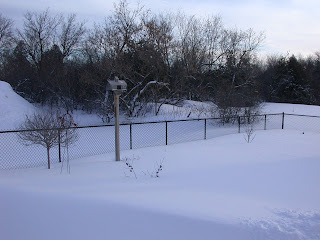 The fence is 5' high, so this gives you an indication as to how much snow is actually resting there, providing a white fluffy blanket to shelter my perennial gardens asleep below. Needless to say, I didn't even poke my head outdoors til this morning. Freshly fallen snow is pretty, indeed...from the inside looking out. 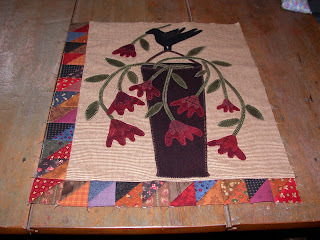 Having said that, I did manage to get more work done on my Primitive Garden BOM quilt. I'm finding that assembling the 10 inside blocks is a bit like putting a jigsaw puzzle together as there doesn't appear to be any directions on how to go about it. I took photos of each of the 10 blocks...yep, I finally figured out how to use the camera. Some of them have the pieced half square triangles on them and others do not. This is a part of the construction puzzle...much like a Rubic's cube...which I was not too terribly good at either. 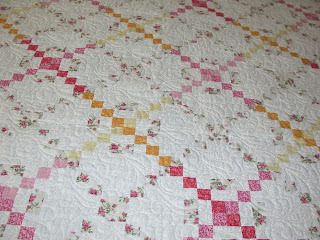 Hopefully, I'll be able to get some of the blocks pieced together before the day is done. And without further ado, my sewing machine beckons! My class yesterday was wonderful! 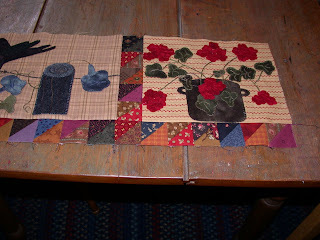 I learned a bunch of new things which I hope to be able to incorporate in my future applique endeavors. According to the news and weather forecasts, we are expecting a foot or more of snow to fall today. Thank goodness I don't have to go out anywhere so I don't even need to conjure up an excuse to spend the better part of the day in my sewing room. I'm still working on piecing together my BOM. Because it's a sampler and each block is a different size, I'm finding that the process is not as easy as I thought it would be. Patience, I know. 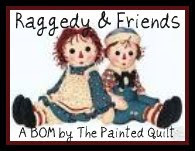 Just before Christmas, I received a call from my friend Barb who is a professional longarm quilter to say that my quilt was ready. Barb had my quilt since May and I told her when I dropped it off that I wasn't in a hurry and to do it when she could fit it into her schedule. And that's it! I love the quilt and it was definitely worth the effort. Hi Ho, Hi Ho...It's off to class I go! I'm so excited because today is my first applique class. I absolutely love stitching by hand and needle turn applique, but today's class teaches the back basting method. 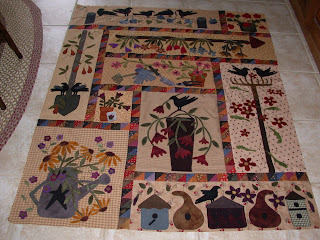 I am basically a self-taught quilter but, thanks to all the blog tutorials out there on needle turn applique...my favorite being Carrie's...I've been able to proceed on my own. Yikes! I think I've figured out how to add a photo that I scanned and saved on my computer. This is the BOM that I'm currently working on that I mentioned in my previous post. Don't you just love it? I'm up-to-date and have completed the 10 blocks that make up the center of the quilt. 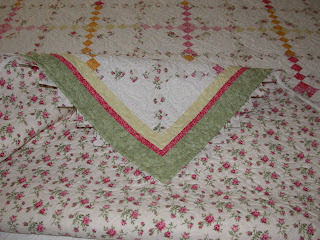 Yesterday I prepared the 206 half square triangles and am now ready to start piecing the sashing. My goal for today is to try to get the center pieced together in anticipation of the arrival of the first of the four outer borders. 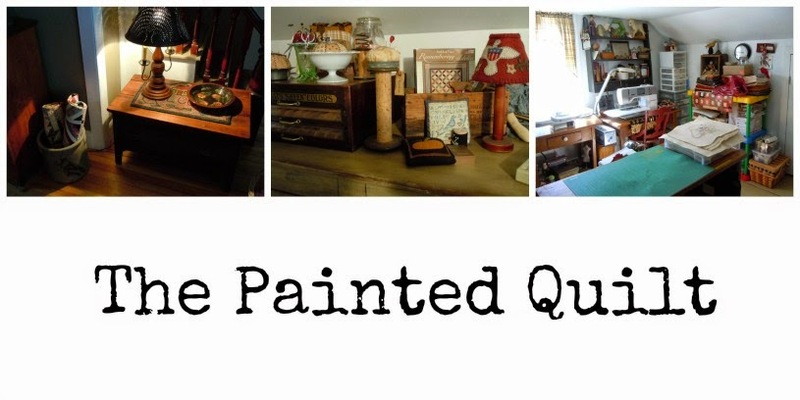 Here's my first attempt at blogging. I've enjoyed reading so many of your blogs that I decided to give one a try. With the help of a friend, here I am. I'm really machine challenged, especially with computers and all related paraphernalia. I bought a digital camera...I'm embarassed to say...about eight years ago, and just opened the original box this morning and am charging the battery as I type this. I love to look at all your photos so I thought I'd better learn about this new "machine" in order to make my blog interesting too! 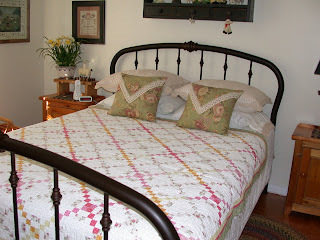 I've always loved quilts, especially antique ones. 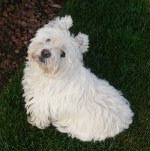 My job involved a lot of travelling and throughout the years, I've been fortunate to amass twenty-two of them which I interchange on my beds on a regular basis. I made a vow that when I retired I would try my hand at quilting and have found that I'm absolutely hooked! I started quilting a little over a year ago. During that time, I think I've managed to conquer the fear of my sewing machine. That "machine", which my husband bought for me as a birthday present in 1997...was still in it's original box as well. I guess Bernina's are like Maytags, huh? 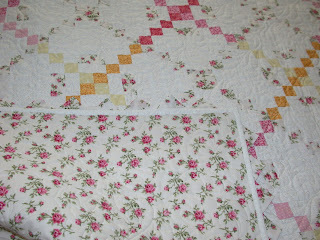 I've made maybe a half dozen quilts since then and will show you pictures of them as soon as I master my camera. 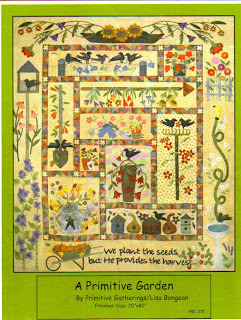 I am currently working on a BOM from Primitive Gatherings, a Lisa Bongean design entitled "A Primitive Garden."